I’m not a baker. Several times a year, when it’s my time to bring choir snacks, I buy refrigerated cookie dough and bake up a dozen or two. Time was when I bought the kind you had to cut into appropriate widths. Now It’s always the kind you break apart and lay out on the cookie sheet. When we have dinner guests, the cognoscenti among our various friends know enough to offer to bring some luscious item. Otherwise, I compose dessert. A slice of pound cake, courtesy of Sara Lee, topped by sliced fresh fruit, courtesy of the season, and a dollop of whipped cream, the kind you squirt out of a can.. You get the idea. That’s what I call baking. Except at Christmas time. As soon as Thanksgiving looms, a mitochondrial DNA sequence, bequeathed by matriarchs long past, begins to chirp.. I start pulling out recipes and planning my Christmas baking project–fruity quick breads, muffins–regular size and minis–and, of course, cookies. I justify these overly ambitious plans with the thought that I will give home made goodies to members of our extended and extensive family. Last year I begged a recipe from my friend for fruit cake cookies that she has often made for us in Christmases past. I love these cookies. I wanted to make them. Now, what you have to understand is that my friend is an experienced and excellent baker. I would praise her more extravagantly but she’s going to read this piece and would object, so I moderate my wild enthusiasm for her skill . One knows going in that one of Sharon’s recipes will not read, “Throw these four ingredients into a bowl, mix and bake.” But, the good news is that she has been a superior teacher for over 30 years, so her recipes contain sidebars that warn of pitfalls and explain that what looks like an impossibly large mound of dry ingredients is exactly what I want to have and that even if the cookies fall apart as I drop them on the cookie sheet, they will, in the end, stick together. Clearly, faith is required,, faith, the “substance of things hoped for, the evidence of things unseen.” I can do faith. I start with some optimism. The first challenge is bowls. 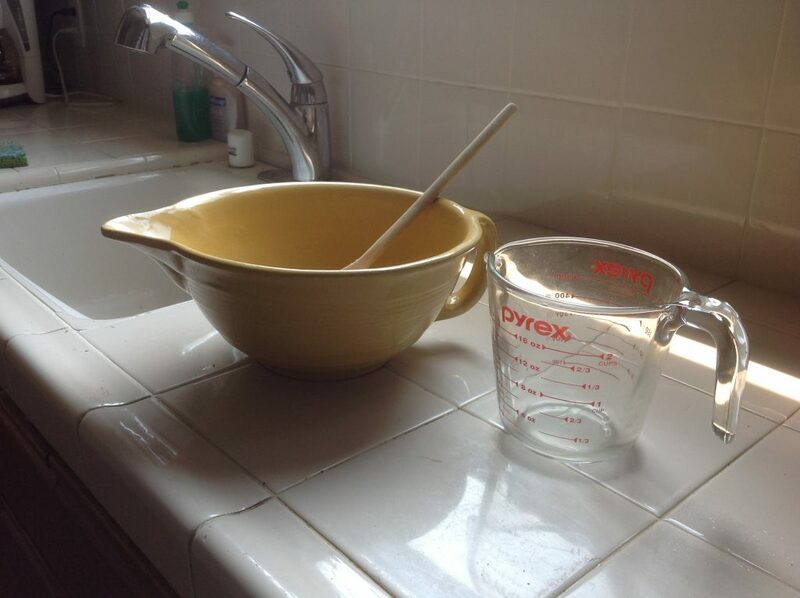 I have one mixing bowl. It’s made of yellow earthenware, heavy and well-used, though not by me. It came to my husband from the previous generation. I have other bowls, of course, stainless steel and plastic. But the yellow one is the one I think of as a baker’s bowl. And I feel more competent just by taking it out of the cupboard. When I read through the recipe, I realize that I need three bowls and that one of them has to be large enough to contain four and a half pounds of dried fruit and nuts. I take down my largest stainless steel salad bowl and start opening those little plastic containers. This year Von’s only had small, four-ounce containers of the citron I need so I had to buy eight of them to get the two pounds required by the recipe. Then there are two containers each of sweetened cherries and pineapple. So I slowly and painfully open twelve plastic containers, worrying the tight lids off with arthritic fingers, and pour the contents into my largest bowl. Some weeks before, I had fallen and hurt my left wrist. It’s been making the baking project more difficult and painful, but I have soldiered on through three sessions of various quick breads and one of pumpkin cookies. Now, however, getting the candied fruit from their containers has exhausted me. It’s time for a short rest. I pour a cup of coffee, even though the cup of bourbon in which the raisins are resuscitating themselves smells tempting. I sit at the dining room table where I can watch the birds at our feeder in the front yard and breathe deeply, trying to remember the few yoga skills I learned several decades ago. Back in the kitchen, I confront a huge mound of citron, raisins, cherries, pineapple and pecans. The challenge of it all puts butterflies in my stomach, but bowl # 1 is accounted for. I read the recipe again and start on bowls 2 ad 3. I cream and mix until butter, sugar and eggs are properly blended in the second bowl. I measure and stir to blend flour, soda and spices in a third. Then I add what seems a minuscule amount of dry ingredients to the outrageously large amount of fruit. The recipe reads “add,” but I assume it means “mix” and I consider what might be an appropriate mixing tool. A trowel comes briefly to mind, but I settle on my largest wooden spoon and set to work. Stirring is usually a matter of wrist action. This particular recipe requires biceps and triceps; Then I add the liquid ingredients and keep stirring. When I finally have the concoction as together as possible, I realize that I no longer am–quite together that is. So far, this recipe has required physical strength and trust. Now dexterity and delicacy of hand movements will come into play and I am not dexterous in the best of times. I need to steel myself. I decide it’s time for another rest and another cup of coffee. Back in the kitchen, I survey the situation. I’ve got a mountain of good chewy stuff barely held together by wet stuff. Now I have to “drop it by spoonfuls” onto cookie sheets. By this time, the mounting awareness that I’m working way above my pay grade has snowballed into full-blown anxiety. “Don’t make them too small,” I mutter to myself. “Don’t make them too big.” “Oops. That one’s falling apart.” “Damn. All of them on that tray are falling apart.” Finally I get the first four cookie sheets into the oven–there will be several loads as this recipe makes five dozen cookies. I turn on the timer and breathe a deep sigh. I wonder if there’s time to lie down while the first set bakes. I wonder if there’s more bourbon in the bottle. I wonder if I can find fruitcake cookies for sale on the web. I wonder why I hadn’t thought of that earlier, before I raided Von’s. I look at the recipe again. You’d think I’d have it memorized by this time. I’m out of luck. The cookies take only fifteen minutes to bake. Oh well, another cup of coffee will have to suffice. And a relaxing trip to the bathroom. Later in the afternoon, I sit with yet another cup of coffee to wash down the Advil. Replacing the Futuro Deluxe Wrist Stabilizer on my left wrist has alleviated some of the pain but not quite enough. And there was no bourbon left. I pick up a cookie from the plate and bite in. Ah. It’s delicious. Just as I remembered. But will I ever want to go through this again? Yes. I decide that the baking project is a lot like childbirth. When the time for the next one rolls around, I’ll have forgotten all the pain and labor. It gets messy, but you can just get in there and mix them with your bare hands. Didn’t I tell you that? Licking the batter off your fingers imparts just the tiniest taste of bourbon! I like the world you live in!